For anyone planning on getting a new puppy this holiday season, the key question may not be "How much is that doggie in the window?" but rather "Where did that doggie come from?" It may be hard to imagine the cute pups found in reputable pet stores being born in overcrowded, unsanitary conditions, but that is just what a new investigation alleges, reports CBS' Early Show resident veterinarian Dr. Debbye Turner Bell. According to a report by the Humane Society of the United States, many stores of the Ohio-based Petland Inc. pet store chain support puppy mills while telling customers the dogs come only from good breeders. The animal protection group made the charge at a Washington, D.C. news conference, saying it conducted an eight-month investigation of the chain headquartered in Chillicothe in southwest Ohio. 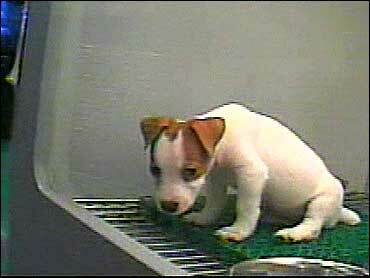 Petland Inc. did not return repeated calls from CBS News seeking comment on the report. But in a message posted on the company Web site, Petland said the company does not support substandard breeding facilities and provides each store with humane care guidelines developed with the U.S. Department of Agriculture. Petland also said the Humane Society's reports "surface every year around the holiday season in conjunction with their annual fundraising efforts ... This is sensationalism at its best." The Humane Society said investigators visited 21 Petland stores and 35 breeders and brokers who sold puppies to Petland stores and reviewed interstate import records of an additional 322 breeders, USDA reports and more than 17,000 puppies linked to Petland stores. "We found very classic puppy mill condition," the Humane Society's Stephanie Shain told CBS News. "Dogs in small cages. These animals were living in those cages 24 hours a day, 365 days out of the year." In puppy mills, hundreds of breeding dogs are packed into cramped, barren cages with no socialization, exercise or human interaction, she said. The stores investigated are perpetuating an abusive industry where dogs are treated like a cash crop instead of as pets, said Shain, director of the Humane Society's campaign against puppy mills. "They know that consumers won't stand for the cruelty inherent in mass-breeding facilities, so they make outrageous claims to hide the reality that the dogs came from puppy mills," Shain said. The Humane Society said its investigators saw puppies living in filthy conditions with inadequate care at breeding operations linked to Petland stores. Also, many of Petland's puppies are not supplied directly by breeders, but are purchased from large-scale pet distributors or brokers - some of whom also buy from puppy mills, the Humane Society said.